Pakistan is NOT a Good ODI Team! Pakistan started off the Asia Cup as favorites and ended the tournament as an embarrassment. They had an easy win against Hong Kong, barely scraped through against Afghanistan and faced embarrassing losses against India and Bangladesh. When you go back in history and think of all those times when Pakistan entered the tournament as favorites, I don't think you will find any tournament where they actually lived up to the tag. World Cup 1987, World Cup 1996, World Cup 1999, World T20 2010, Asia Cup 2018 and so many more. At the same time, take a look at the tournaments they won and it was those where no one gave them a chance at all. World Cup 1992, World T20 2009, Asia Cup 2012, Champions Trophy 2017. There are so many bilateral series and triseries that have gone the same route for Pakistan. Why then even give Pakistan the tag of favorites? We were so confident about the Asia Cup. The fans, the team, the odd makers, everyone thought the tournament was Pakistan's even before it began. I guess a combination of Pakistan's Champions Trophy win, 'home ground' conditions in the UAE, and Pakistan's recent decimation of Zimbabwe 5-0 resulted in everyone feeling that Pakistan was a great ODI force. When in fact they really are not. Maybe in online cricket, but in International One-Day Cricket they are a below par ODI team. Pakistan is currently ranked 5 in ODIs and just last year they won a global ODI tournament involving the top 8 ODI sides in the world, but that Champions Trophy win was an exception amidst an abysmal run in ODIs. 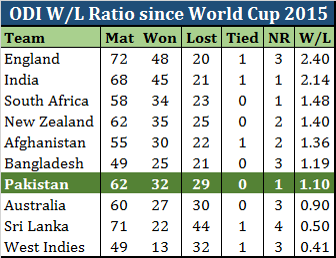 If you take a look at 3-year ODI performances of the 10 teams that will be playing the ICC World Cup in 2019, Pakistan's W/L ratio is at the bottom half of the table. Sure, one can say that Pakistan has won more ODIs than they have lost during this period and this cannot be termed as abysmal. But delve a bit deeper into this record and you will realize that 26 out of those 32 wins have come against Sri Lanka, West Indies, Afghanistan, Zimbabwe, Ireland, and Hong Kong, which are teams ranked 8-12 (all below Pakistan) and a team that does not even have ODI status. That leaves matches against the top 4 ranked ODI teams - England, India, New Zealand, South Africa - plus Australia and Bangladesh. 6 wins in 31 matches over 3 years! That is a success percentage of 19%. Now if that is not abysmal, I do not know what is. Plus, 3 out of these 6 wins came in the Champions Trophy last year. Signs of improvement? Maybe so, but then we were blanked 5-0 in New Zealand earlier this year! So no. We are not a good ODI team. We recently reached the top in test cricket. We leveled a test series in England this year. We are the current number 1 T20 team. But when it comes to ODIs, we are at the middle of the table with a pathetic record against the top 7 ODI teams. We have not beaten Bangladesh even once since the last ICC World Cup in 2015. And here we were thinking we were the favorites to win the Asia Cup. This brings me to World Cup 2019. The round robin format means to qualify for the semifinal a team will have to win, at a minimum, 5 out of its 9 matches. Even then it may not make it. 6 wins might guarantee a spot. Who will these 5-6 wins come against? Think about the opposition Pakistan will face. On one hand you would think about the matches that you should win, i.e. the bottom ranked teams - West Indies, Sri Lanka, Afghanistan, and Bangladesh. Pakistan have not beaten Bangladesh in the past 3.5 years and have lost 4 consecutive ODIs to them. And they just scraped through against Afghanistan in the Asia Cup. Are these 4 games sure wins for Pakistan? Definitely not. For a minute consider that Pakistan does manage to win these 4 games. It then still has to win 1 or 2 games out of the matches against India, Australia, England, South Africa, and New Zealand - teams against whom Pakistan has won only 6 times in 31 games since 2015. Do we really think we are among the top 4 ODI teams or capable of being among the top 4 at the ICC World Cup in 2019?